Your king has asked you to build a small settlement in Hobnibitt county, and requests a few goods. The county is rich in iron, making metal armor should not be a problem, and has more than enough farm land to feed your people and make a few leather armor and get in a few barrels of ale as well. In your new keep you will find the land is also rich in lions, you will have some weapons to make a few troops with, you both know that bandits are in the area and will more than likely come for a visit, don't be surprised to see a few fires here and there, wheat rot and hops weavel will be competing against the tree fungus for top spot. Archers and Spearmen will have to save the day, the lions have a hearty appetite, the bandits might laugh at you if you try and get to close, your lord might have to get his hands dirty if you want to survive in this rich land! is this map really beatable, as the space of time (short time limit) seems to make it impossible? Yes the map is winnable, I have a save where the last leather armor came in June 1230, you have until 1234. I could send you the save to see how I set up my castle. The map does have a lot going on, plus a few decoys to trip you up, make some archers to deal with the lions, use the 2 closest patches of farm land, clear the wood and get the resources needed for the weapons. 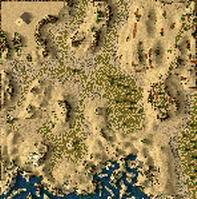 Good to see you around Stratego, Thanks for playing my map and the comment. Welcome back Sir Vet! I'm glad to see you posting maps again. I enjoyed playing Hobnibitt, but once I had sufficient archers & spearmen it was just a wait until I produced all the goods. My first attempt had victory at July 1230, but I could probably improve on that. I didn't realize there was a cutoff time. There are many decisions to make in the early stages as your trading options are very limited. The Lord also needs to start killing lions immediately to protect your woodcutters & farmers. How about posting some of the maps I tested for you a while back? Email me. Hey riderwiz, good to see you again. I was asked to make this into a war scenario, it should be posted soon! Yes I will be posting those maps as soon as I get some time, I have been working over at strongholdnation, we have an easy contest going, you should give it a try! I guess I'm too silly to win this map; it is way too hard for me; I don't know how to start with or how to deal with the lions in an effective manner ... how can I stock up enough wood to get all the necessary troops and resources by simultaneously dealing with bandits and lions? Your just not getting the right way, I load the center with woodcutters after making my troops and dealing with the lions, you can place a few woodcutters early in the right spot. I got a save from another player, he moved the stock pile and granary to the center, we both finished with more than 3 years to go, keep at it you will get it, just make a few changes. you hardly may believe it ... I finally have beaten this tricky thing! Though a bit later than you did, but on April 1233 I got "victory" on the screen! It took me two attempts by using our helpful hints. You're absolutely right, it is definitely hard at the beginning, but replacing the stockpiles is a good idea that eventually worked! Thanks for your support. Congratulations Stratego, I new you could do it, just had to make a few changes, moving the stockpile and granary to the middle of the map does make it easier, I never tried that myself, but the new war version has the Keep in the middle, the goods come in a lot faster. I find the easiest way to handle all the lions is send the king backed up by 2 archers. Have the king next to the archers (by alternating clicking on lions/keep) as they start shooting & by the time he reaches the lions the archers should have killed 1. Meanwhile place some orchards & w/cutters. Better to kill all the lions like this before the deer disturb them. The king's health should finish being at least yellow. You need to conserve your trees by deleting any w/cutter who is about to chop a young tree. Only chop fully grown trees. I start with the Lord killing the 3 lions by the keep and make the troops to deal with the rest of the lions, after the first 3 lions are done then I start getting wood going, to get enough wood in the end I delete buildings that are not needed any more. Now you can go and have another exciting time playing the war version that is now in the war scenarios, good luck!